Hi Guys! Hope everyone is enjoying their summer so far. It’s so hard to stay inside and sew when the whether is calling for us to be outside. 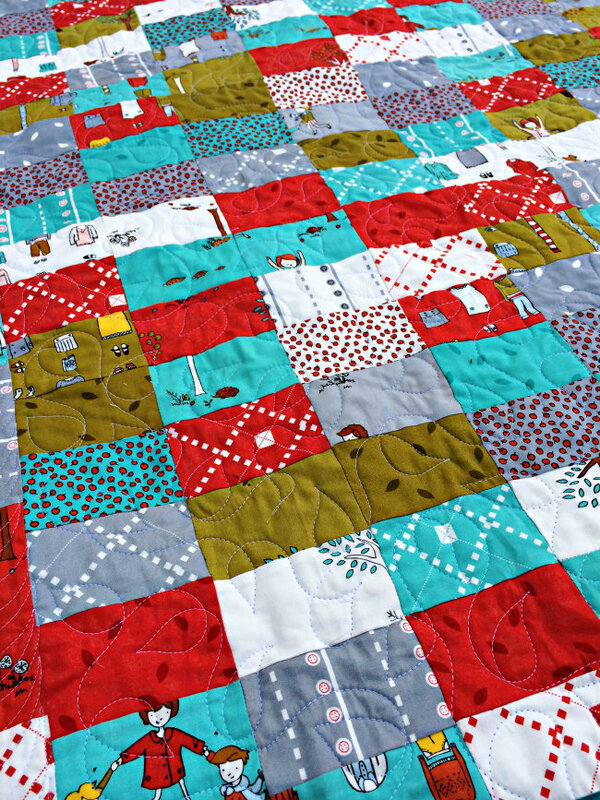 On one of my online fabric hunts, I stumbled across Little Apples by Aneela Hoey. I fell in love instantly with this line. I love the playful mixture of red, turquoise and gray with a background of children and trees. 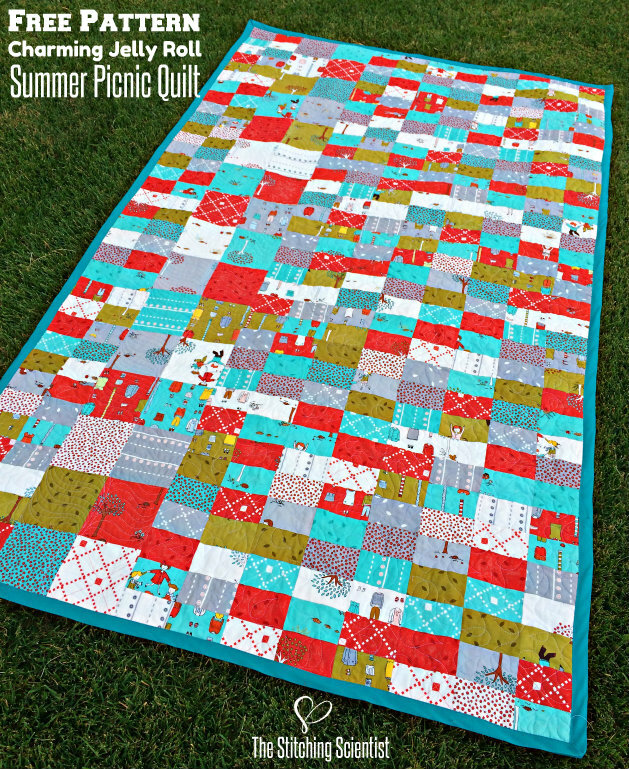 I decided to buy a jelly roll and a charm pack to create a nice summer picnic quilt. I like doing quick sewing projects that gives me instant gratification. That being said, doing a quilt that takes months or weeks to complete doesn’t work for me. 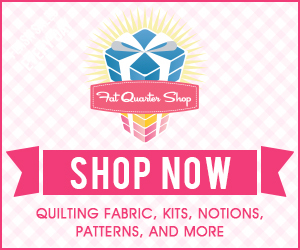 I decided to create a super easy beginner quilt top pattern that can be finished in a few hours. 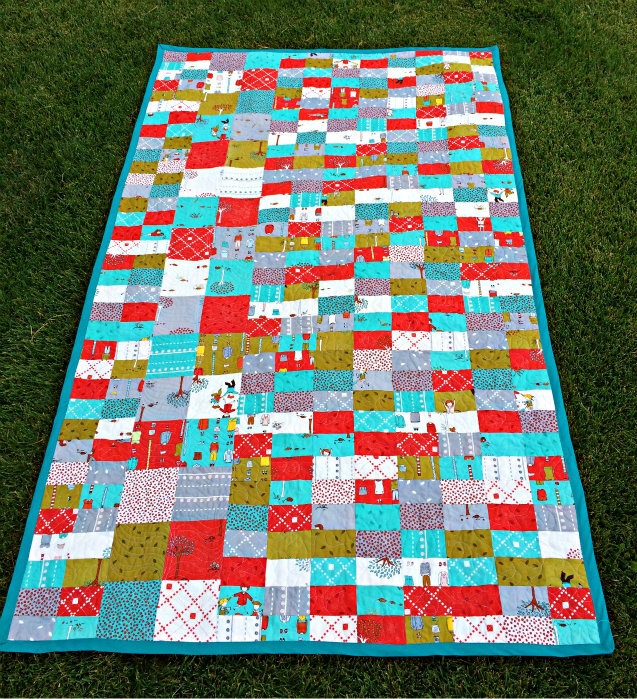 This quilt uses one jelly roll and one charm pack (hence the name “charming” jelly roll quilt) of the Little Apples line. I hope you enjoy the free pattern and tutorial! I had Melissa from Sew Shabby Quilting do the design on this quilt for me. She surprises me every time with her creativity and talent. 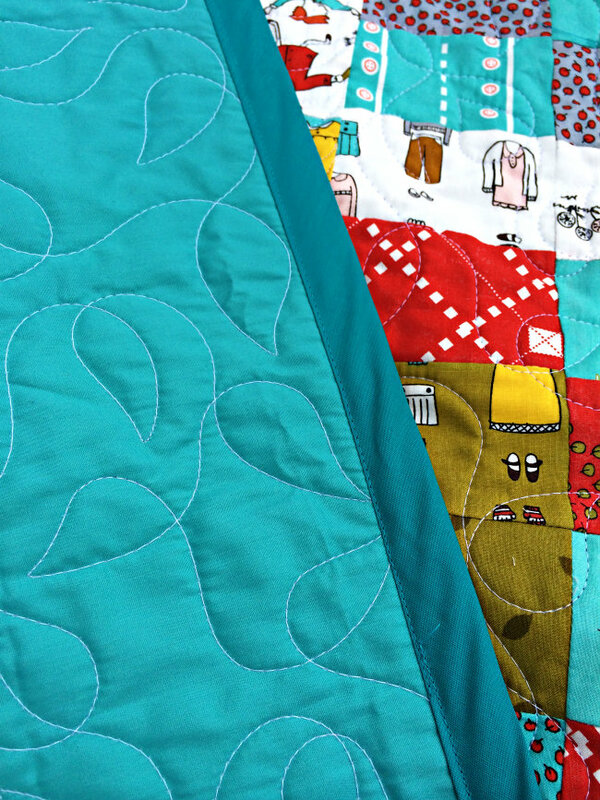 For this design she did a vine where the charm pack is and small leaves throughout the rest of the quilt. The design works perfectly with the apple and tree pattern on the fabric. I also used to a full size sheet for the back which I got for around $8 at Walmart. You can see how cool the long wines look on the charm packs here. 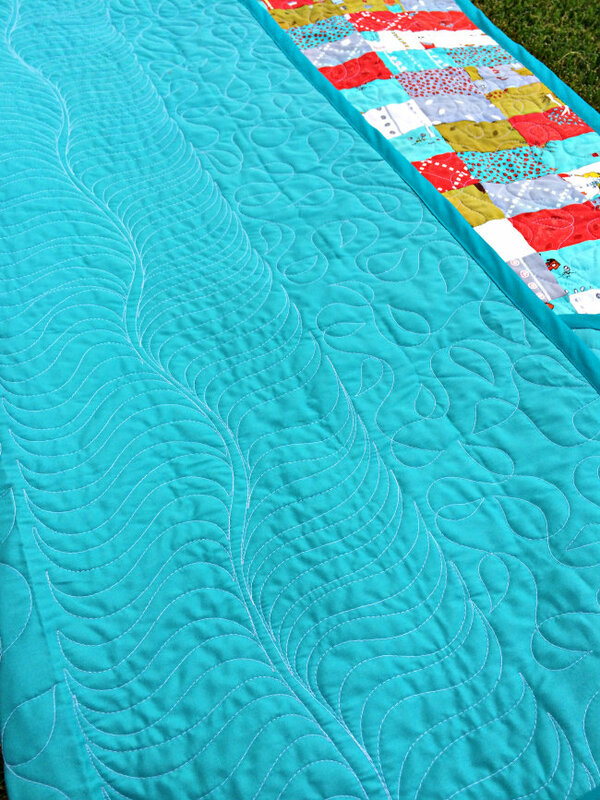 For the binding, I was lucking to find this perfectly matched turquoise 7/8″ quilt binding at Joann’s. I ended up using just over 6 yards to complete the quilt. With little time and no patience, I decided to do machine binding which ended up looking just as good as handing binding in my opinion. 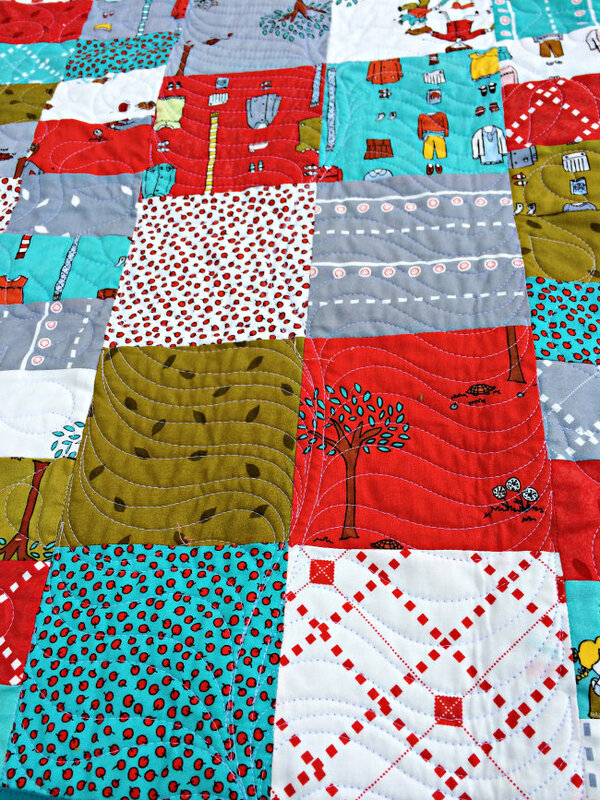 It’s been a while since I was this excited about a fabric line but I am absolutely in love with Little Apples. The colors goes so well for a summer day at the park. Here is a close up of some of the patterns from the line. I think my favorite is the red apples on the blue/turquoise background. You can download the free pattern HERE. 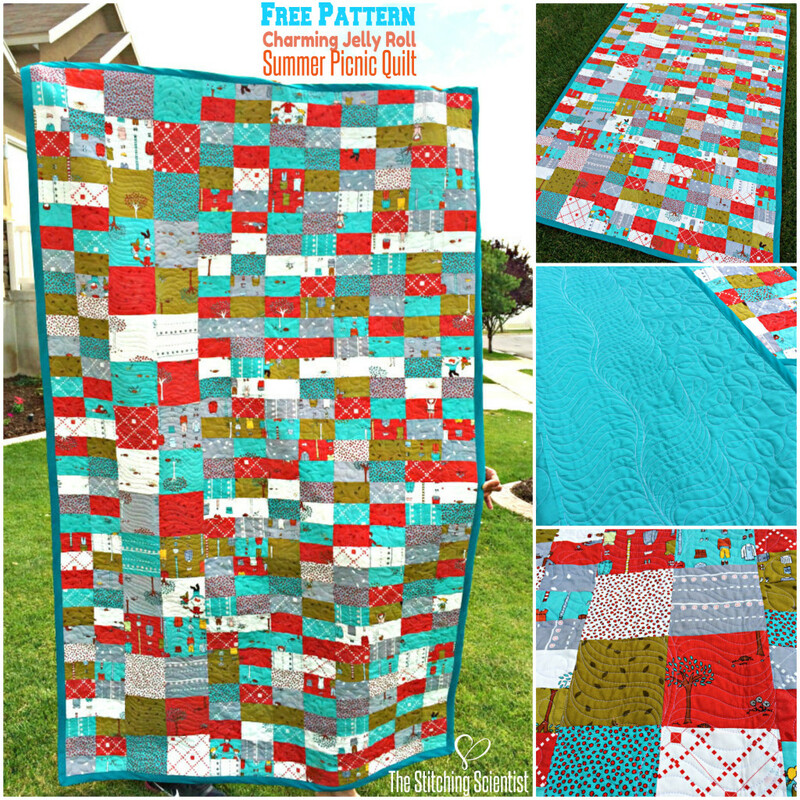 The download has step by step instruction on how to create the quilt top. 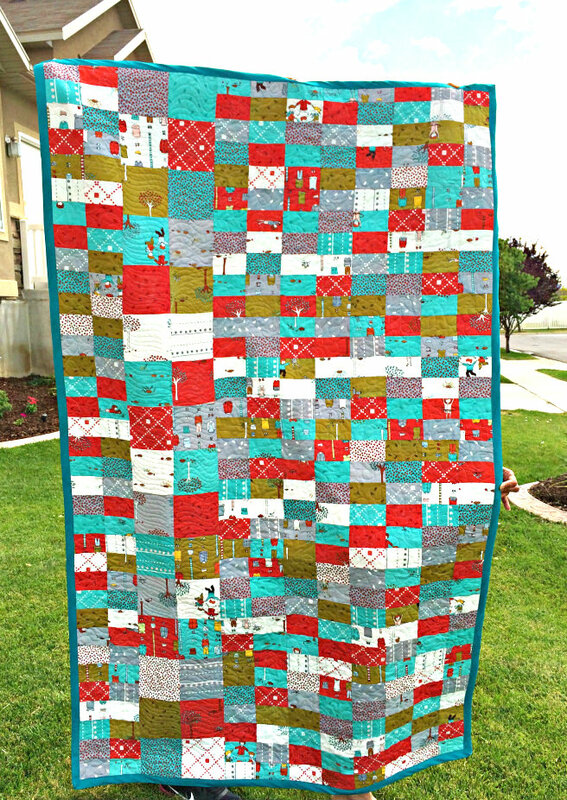 The finished top with 1 jelly roll and 1 charm pack measures ~ 75″x45″. This pattern and instructions is for the quilt top only. If you would like to know how to actually put the top, the batting and the back together, you can follow my table runner tutorial.